Seems that the only traveling I find myself doing these days is either up and down the California coast. While my return to trip to Israel in December was an exception, I discovered this week that low mileage traveling combined with stellar live music can be quite satisfying to this nomadic wanderer. I got lucky. Lucky in several ways. 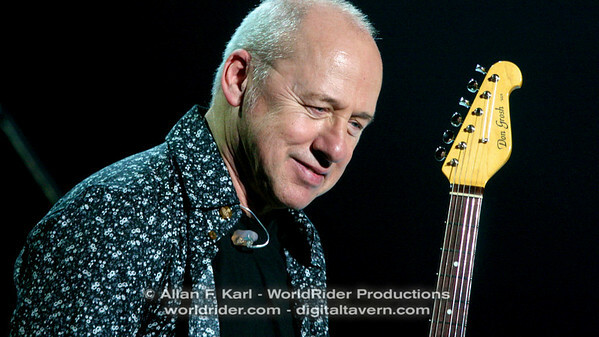 First, lucky that Mark Knopfler booked two different venues for three southern California shows featuring his latest release “Get Lucky.” I am also lucky that I had the opportunity to see Mark perform at each of these venues. First, at Pechanga Casino in Temecula–in the shadows of Southern California’s far from burgeoning wine capital. It’s not for the lack of effort or monetary investment that Temecula wines are second or third-class citizens compared to virtually every other wine region in California. But I digress. 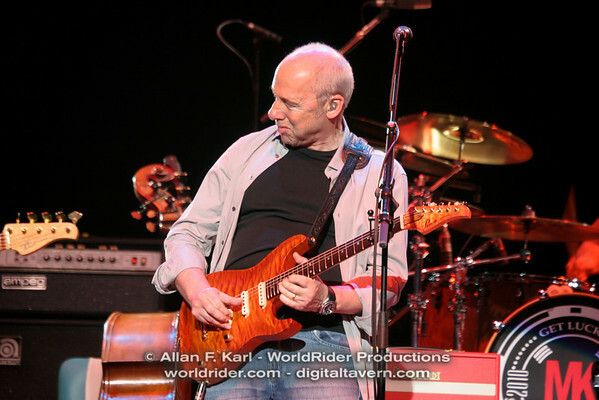 The second Mark Knopfler show I was lucky to catch was at the classic Pantages Theatre in the heart of Hollywood. Marked by impressive colonial architecture and a palatial auditorium complete with an ornately complimented balcony, The Pantages opened on Hollywood Blvd in 1930 as part of a national circuit of Vaudeville theatres. In 1949 the eccentric aviator and RKO Theatres owner Howard Hughes bought the theatre and proceeded to move his personal office there. And for ten years through 1959 the Academy Award ceremonies were held there. Today it hosts broadway productions, musical concerts and is a favorite location for television, cinema and music video productions. As for Pechanga? Thanks to the Supreme Court decision and California voters approval of Proposition 5, today it’s the largest Indian Casino in the state. If you haven’t picked up or downloaded the latest Mark Knopfler album, Get Lucky , I strongly suggest you give it a listen. Combining American folk, rock with Scottish celtic melodies and great story telling, it’s another example of why Mark Knopfler is not only one of the most prolific and satisfying musicians of our time, but also another example of how one of the hottest selling artists of the 80’s continues to grow and deliver new material rather than rehashing the same over and over again. So with my lucky tickets in hand, I enjoyed Knopfler and his seven piece band artfully and with passion draw from Knopfler’s (and his Dire Straits) diverse catalog of rock, folk, country, and blues melodies and ballads where his signature guitar and whispering and sometimes gravely voice delivered what everyone wanted while offering surprises along the way. Often understated and always unassuming Knopfler worked the night using some six or seven guitars while his band kept time, rhythm and melody with a bevy of instruments that could fill a museum including an accordian, fiddle, ukelele, penny whistle, Hammond B3, piano, bouzouki and octave mandolins, banjo, cittern, bagpipes, flutes and many others I either don’t recognize or simply forgot. Mark and the band played to a sold out show of 1,200 at Pechanga while some tickets were available for Mark’s second show at Pantages, I think it’s safe to say he filled every one of its 2,703 reserved seats both nights. While a more intimate venue and yet lacking the history and magnificance of the Pantages, the Thursday night show at Pechanga marked only the second time I’d seen Knopfler solo, the first was summer of 2005 while I was on the North American leg of my around the world motorcycle adventure. I was heading to the Arctic Ocean when I learned he would play at Chateau St. Jean Winery just outside Seattle. Thanks to my friends Jonathan and Dr. Love, who worked there, I was able to take a brief break from my tour to see Mark on his. At Pechanga the band started off with a driving version of Border Reiver, a song about the lives of truck drivers in Scotland in the 60’s. Pechanga’s crowd was diverse and perhaps the heckler’s shouting rudely at Mark to easily gave away their homeland roots. In feeling the energy of the band, I felt that they weren’t 100 percent in sync, though each individual’s musicianship signed and drew standing ovations at nearly every song. And the last song of the evening saw more than a hundred people run for the stage proving southern California has no shortage of energy. But at the Pantages, the band was on fire. The ninth show of the tour, they are still warming up. If I could figure a way I’d be in New York, DC or Boston later in May as the band winds down the North American leg. Also at Pantages, the band pulled out another trick that wasn’t used in Pechanga: instrument mounted cameras. I thought it odd when Mark appeared after yet another guitar change with a funny protrusion on his guitar. It wasn’t until the curtain behind the pand revealed a large screen did I figure this out. This way the crowd could see Mark playing every note of Sultan’s of Swing. Even better, these aren’t High-Def cameras with pristing images. Instead, they are more like rudimentary web cams, low res and mixed with abstract images providing more texture and color than close up reality. I like this and wonder why it wasn’t used at Pechanga. There was one other annoying thing at Pechanga. Despite the band’s current policy to allow photography (no flash and no video) within the first song at Pechanga security made it clear they didn’t want to see my camera. Though at Pantages, the venue, aware of the band’s policy, allowed my camera inside. However, the lady next to me continued despite my glaring eye to take pictures with flash. I was sitting in the tenth row, and I know this annoys other concert goers and distracts the band. I never use flash nor obstruct others when taking pictures. You can check out a sampling of the shots from both nights on my website here. I also learned that after the show in Temecula, the band took a very quick flight in their chartered jet back to Van Nuys airport—probably took them 20 minutes. It took me a couple days and ride up the 5 freeway so I can joy them again for the best show of the tour, so far. Perhaps not as adventurous as riding around Sudan, but that little bit of travel coupled with some stellar live performance and musicianship certainly satiated my urge to wander and help me continue to focus on the exciting projects I’m working to complete by the summer. Previous post Going Mobile. Going Social. What’s It All Mean? Next post How Does Apple Grab So Much Attention? Always.